Every year, schools all across the United States spend the first week of March celebrating the wonderful works of Theodore Geisel, better known as Dr. Seuss. This year Dr. Seuss’ birthday fell on a Wednesday (March 2nd! ), and we spent the whole week celebrating his life, his passion for literature, and his wonderful books. Check out the photos below from our silly, spectacular, surprising, stupendous, Seuss-alicious Dr. Seuss themed spirit week! 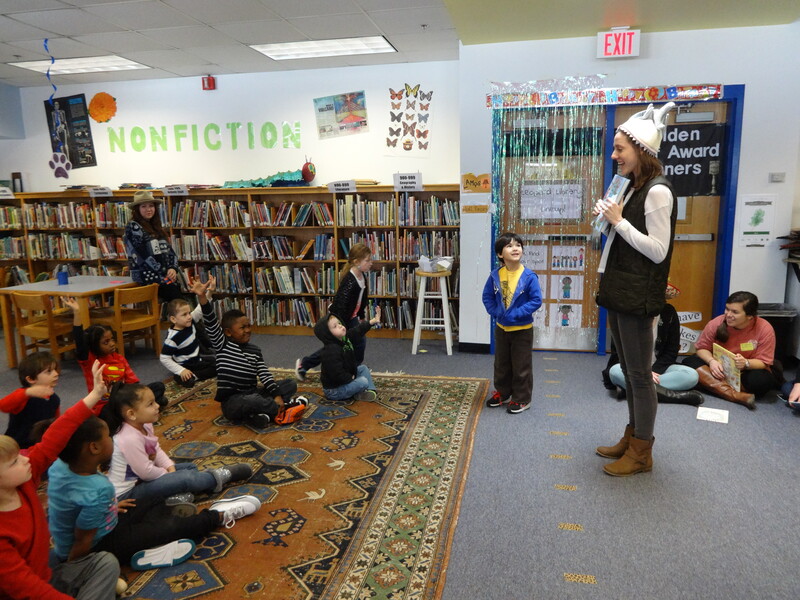 On Monday, we celebrated the Cat in the Hat by with silly hats. 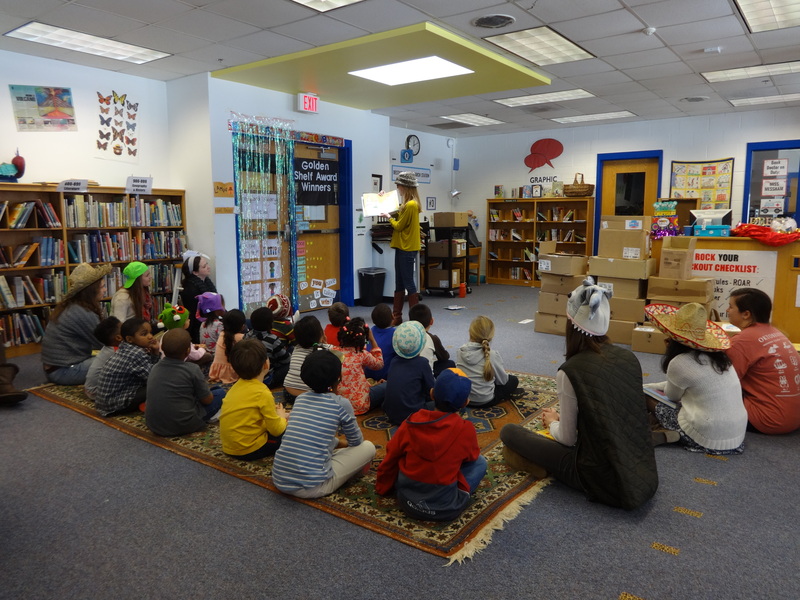 Above, pre-k students enjoy a 10 Apples Up on Top dance party with some wacky headgear! Tuesday we were all about Fox in Socks – with crazy socks and shoes. I saw some truly awesome combinations on feet that day, but Rashid, on the left above, sported one of my favorites! The pink polka dotted slippers made me laugh all day! Wednesday we had a double-dose of excitement. Wacky Wednesday inspired some truly magnificent outfits, but I was too busy enjoying them to get very many pictures! 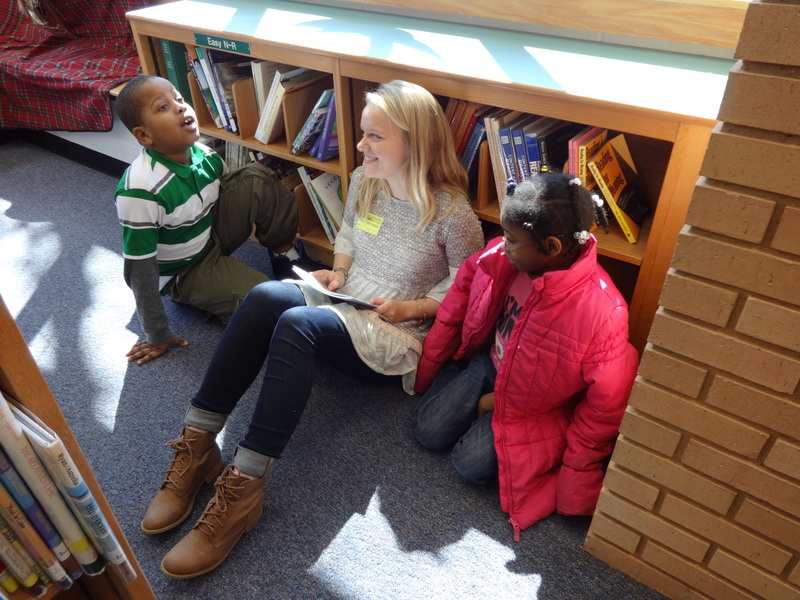 Kindergarten and first grade classes got a special visit from the University of Virginia’s Pi Beta Phi service sorority. These lovely ladies celebrated their annual day of service by leading a story time and a craft with students all afternoon. They shared Seuss stories and helped students to make bookmarks to continue their reading at home. Thursday was another jam-packed day, with another very special visitor. We used our imaginations to travel all over the world for a day based on Oh, the Places You’ll Go! Students were invited to dress for the favorite vacation spot, whether real or imagined. In the top photo, I’m sharing a silly story with pre-k in my best beach gear! Next up, we got our annual visit from the Cat in the Hat – one of my favorite moments of the year. I love watching students’ faces when he saunters into the room with that iconit hat and bow tie! The Cat was extra prepared this year, with hugs, fist bumps, and dance moves (he was dabbing all over the place, much to students’ delight). Helping to bring beloved stories and characters to life is one of the best parts of this job, and there is nothing quite like the moment when a story jumps off of the page. 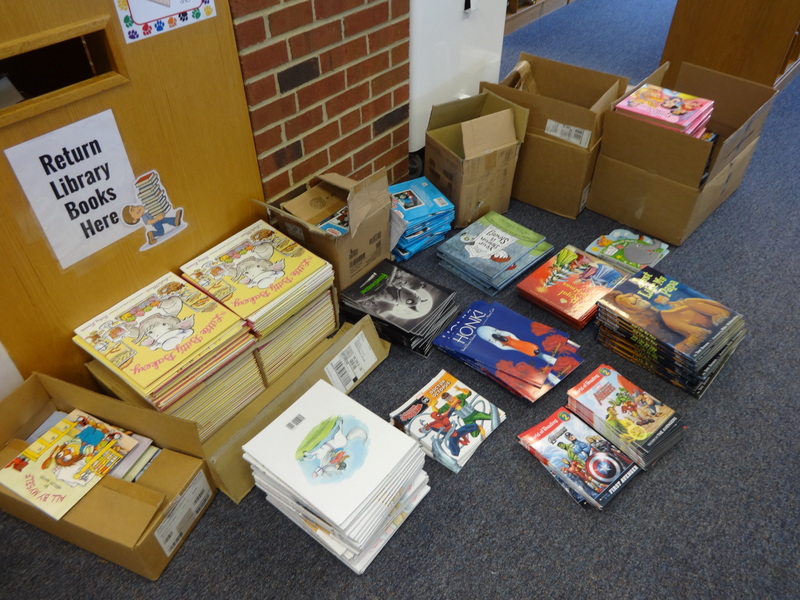 Thank you to our dedicated and very patient Cat in the Hat for bringing this joy to Johnson every year! The action didn’t slow down on Friday, with one last guest and the most popular spirit day of the week. In the top photo, kindergarten gets a classic Seuss story (Mr. Brown Can Moo, Can You?) from a guest very close to my heart – my mom! 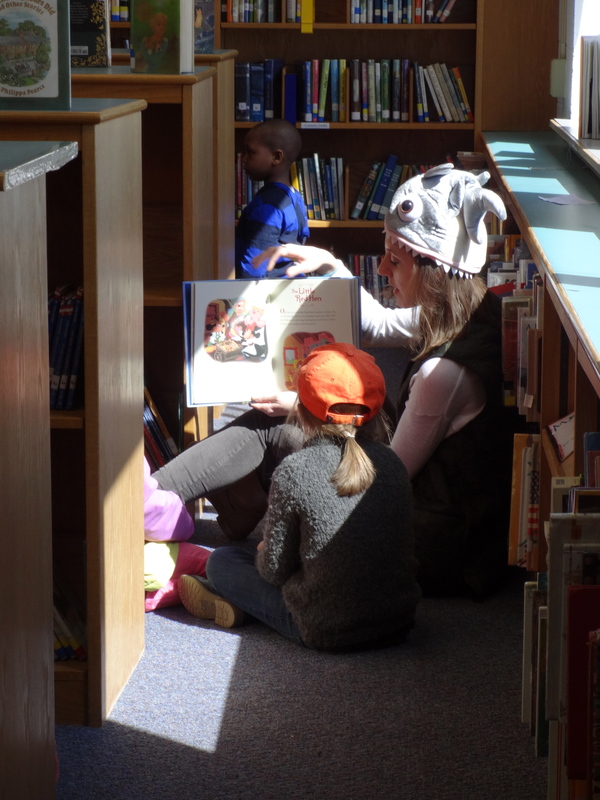 She spent the day shelving and reading with us in the library, and loved this opportunity to read with some of our littlest Leopards. It’s easy to see the joy on her face! Finally, the wockets came out in full force for Friday’s There’s a Wocket in my Pocket day. Students were invited to bring their favorite stuffed animal from home and carry it in their pocket all day long. 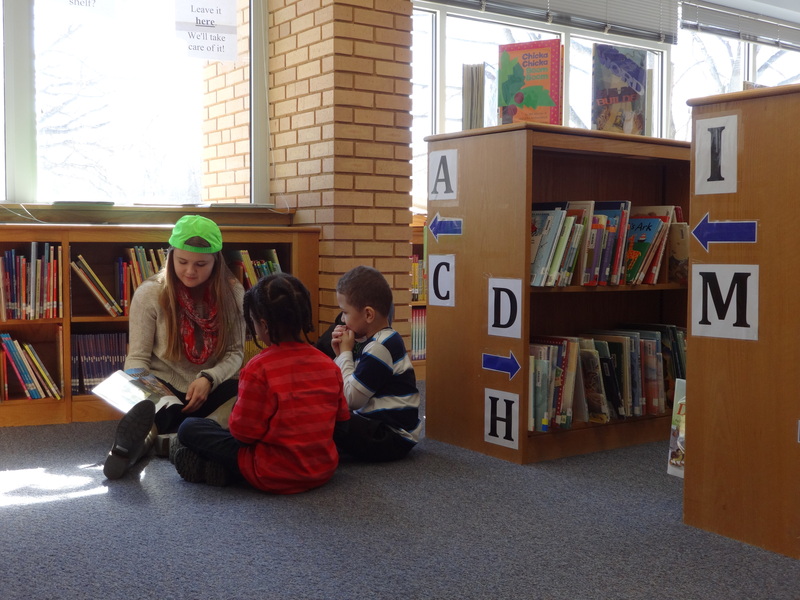 You can see third graders above sharing stories with their wockets during their library checkout time. What a fun spirit day! Thank you to Johnson’s Leopards, staff, and families for helping to make this another wonderful Read Across America week. I had so much fun celebrating with all of you! Coming Soon: Johnson STEAM Team! Fourth grade parents, heads up! This afternoon, STEAM Team flyers will be coming home with your students. The first session will only be open to fourth graders, but the plan is to open the club to younger grades soon. Check out an electronic version of the flyer below for details. Return your completed flyer to the library by Monday, January 18! Send any questions my way at fitzhes1@charlottesvilleschools.org. See you there, engineers! Have you heard about our awesome new engineering club, the Johnson STEAM Team? We’ll be buildin’, makin’, movin’, and shakin’ thanks to your awesome donations through DonorsChoose. Check out the page for the project here! 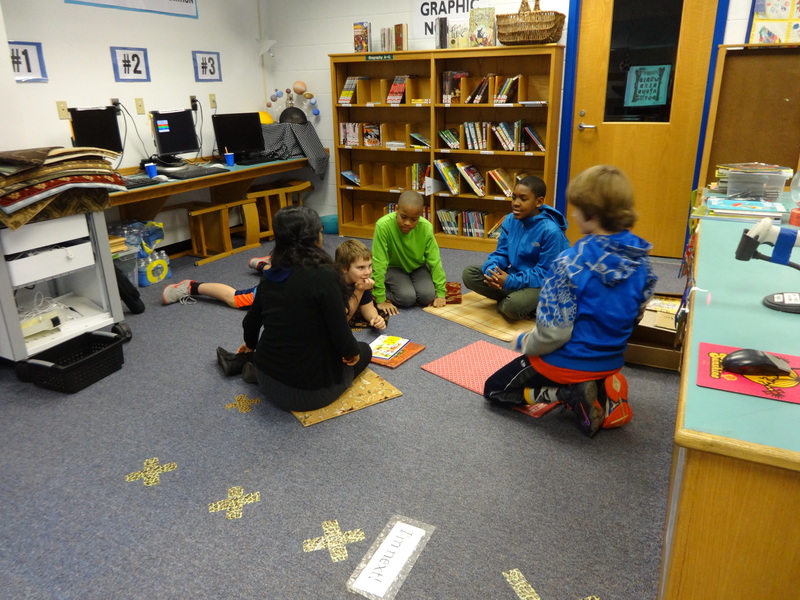 Earlier this year, Johnson was chosen by the University of Virginia to receive a grant through ALCOA to bring new and exciting technology into our library. A new software is being designed and beta tested for student use, and UVA wanted us to be a part of its creation. (Um, sign me up please!) After a series of meetings, I was able to create custom profiles for a small group of students to get them logged in, exploring, and learning about the digital maker movement. I asked them, “Would you like to skip recess in order to be a part of a team to beta test new groundbreaking software for students everywhere?” Can you guess what they said? MakerStudio (#makerstudio) is an online program that provides a blank canvas for users to create and explore. Using a wide variety of tools, users can tell their stories in vivid color through free design or a selection of ready-to-use shapes and clipart. They can add text, layers, shapes, or use mathematical tools to enhance their art. More experienced users can toggle one of the advanced options to create a document specially designed to include a 3-D popup, link to a Silhouette die-cutting machine, or make scanned artwork come to life. The options with MakerStudio are limitless – and we have been chosen to test it out! The first time we logged this group into the program, Miss Esposito and I had one rule – we have no rules. We set the group loose without any guidelines, directions, or pointers. When they asked questions, we pushed them to find the answers themselves. When they got frustrated, we asked then to retrace their steps and try again. This, my friends, is Making at its best – trying, failing, trying again, and learning from your mistakes. It was amazing to watch them build, delete, rebuild, and grin! While they were working, the group collected data on any “bugs” or issues that they found in the program. Today, we met with one of the members of the UVA team to show off what we’ve learned, and the group reported the bugs that they had found. Our UVA contact said that she would report the bugs to the software development team and that thanks to Johnson’s students, these issues would be resolved when the software launches live! Another great example of Making in action – using the knowledge and experience you gained from your mistakes to help others succeed. Kudos to our MakerStudio Student Team! Stay tuned for more updates on our #makerstudio experience with the University of Virginia. 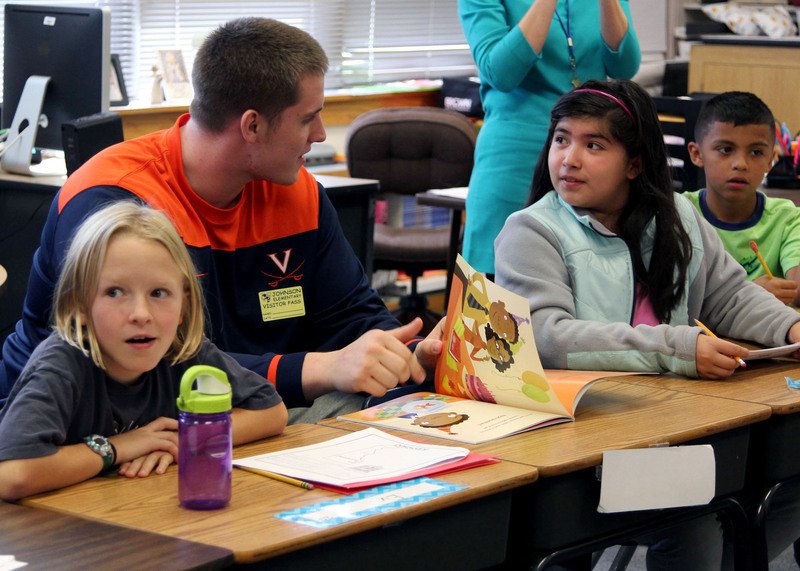 UVA Football helps Johnson to Read for the Record! Jumpstart’s Read for the Record® is a global campaign which generates public support for high-quality early learning by mobilizing millions of children and adults to take part in the world’s largest shared reading experience. On October 22, 2015, Jumpstart celebrates the 10th anniversary of Read for the Record with the campaign book, Not Norman: A Goldfish Story, written by Kelly Bennett and illustrated by Noah Z. Jones. 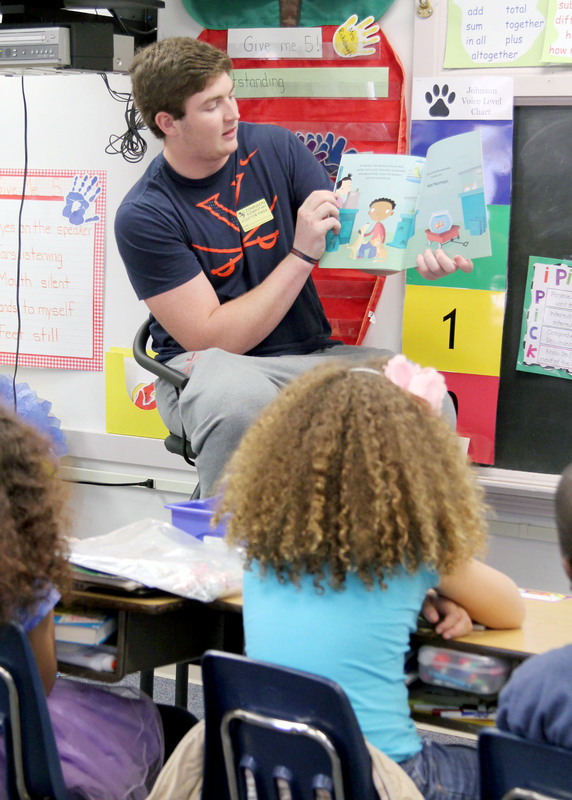 If there’s one thing that Johnson kiddos know and love, its the importance of literacy. 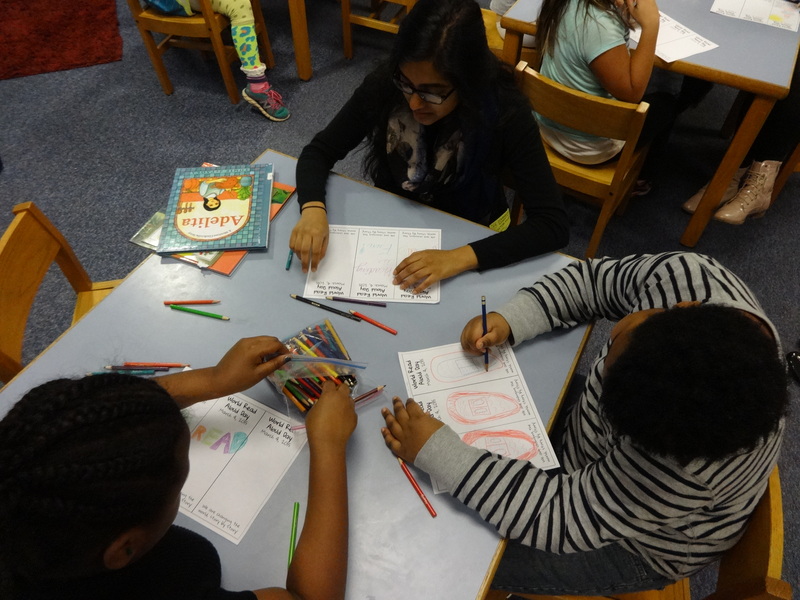 (Trust me here – my full time job to is to buy, maintain, and organize the books that these kids read… so I know just how passionate they are!) So a day all about the love and importance of reading is right up our alley. We needed to add our 350 students to the list of the millions participating around the country. Which means that somebody had to share a story with Johnson. 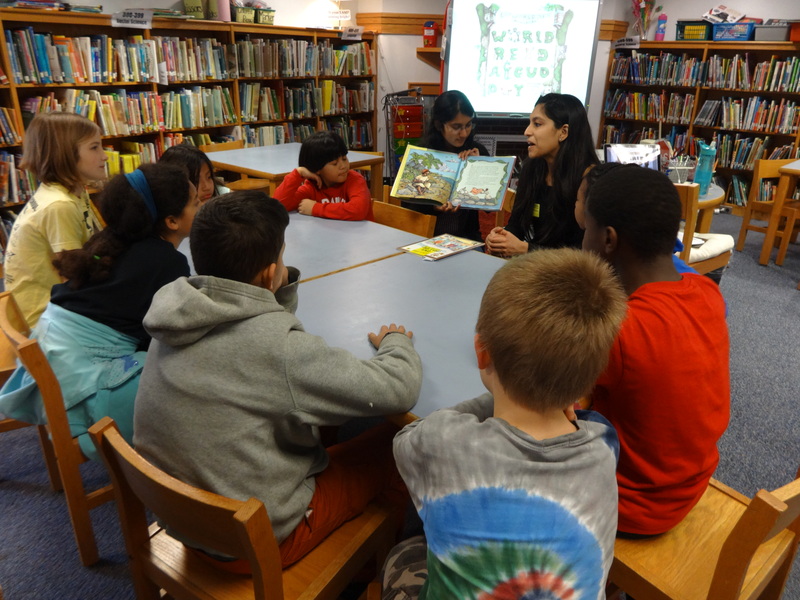 But, to be honest, these kids hear me talk about books a lot. They hear their teachers talk about books a lot. And they hear from our school celebrities like Mr. Stern, Ms. Thompson, Ms. FitzGerald, and Ms. Pillow quite a bit, too. This year, I really wanted to go for the wow factor…so I decided to call in some favors. 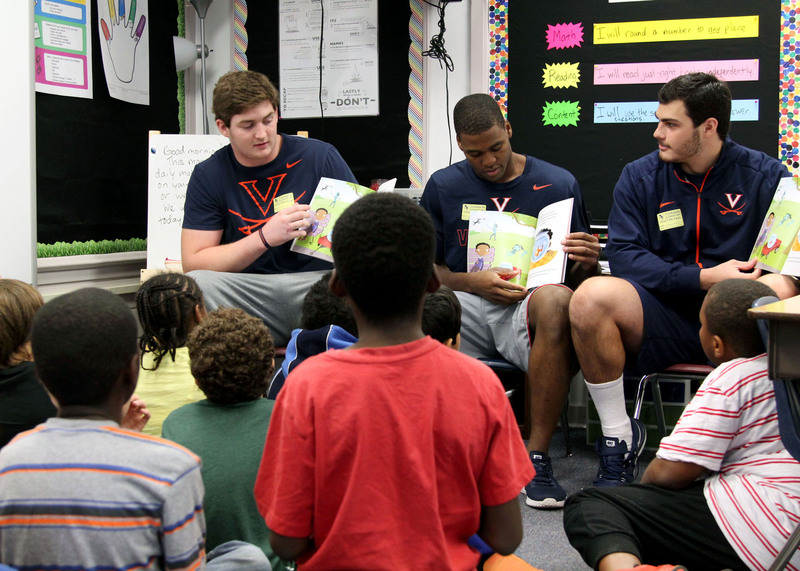 That’s right – we were lucky enough to get to spend Read for the Record day sharing stories with Charlottesville’s favorite guys – the University of Virginia football team. Players spent the afternoon talking, laughing, playing, and sharing with our Learning Leopards, talking to them about football, school, reading, and how they got so strong (seriously, there were so many questions about muscles!). Each class got to hear this year’s Read for the Record story, Not Norman, written by Kelly Bennett and illustrated by Noah J. Zones. My favorite part about the visit came after the final page. 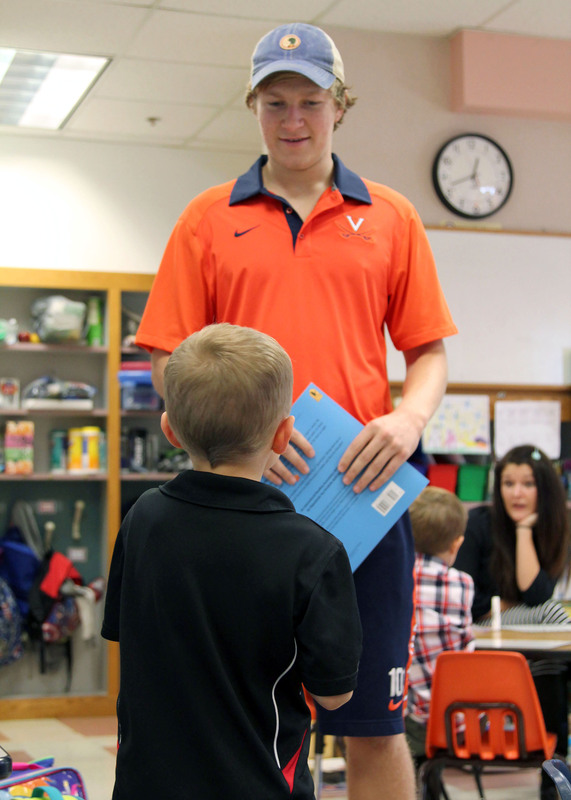 As students had the chance to ask questions and get to know our guests better, each young man talked about not only their football experience at UVA, but their studies. 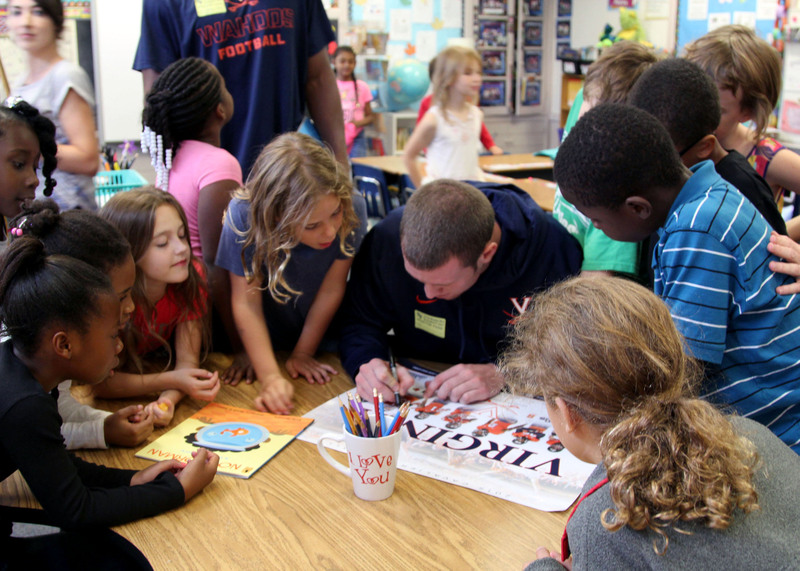 They mentioned how hard they had to work academically to make it onto the team, the classes they are taking, and how important it is to them to earn a degree during their time at UVA. They talked about how much they love to read and what they planned to do with their majors after graduation. I can’t express how much it means to me as a teacher to see our students’ heroes making education a priority. 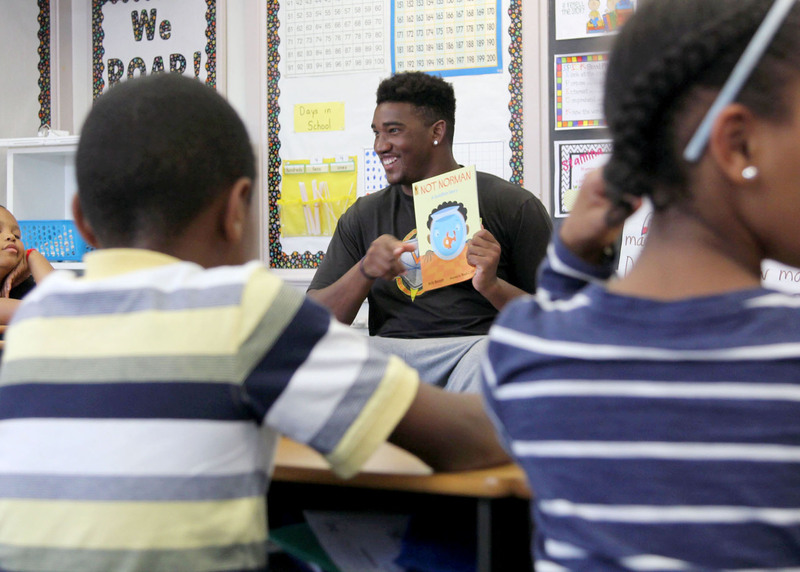 While the guys laughed and the students cheered, I got choked up knowing that what they would remember from this day would be that a football player came into their classroom…to read to them. 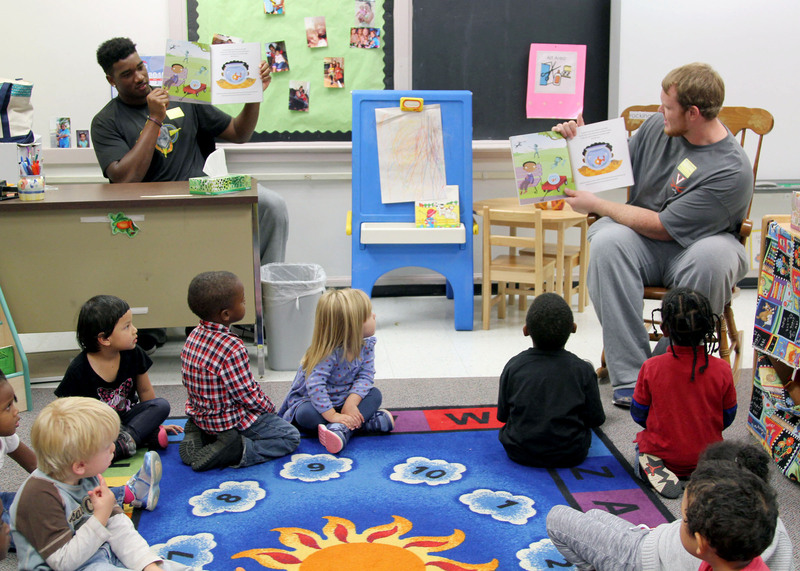 That they got to sit and chat with a famous athlete…about literacy. I have some street cred around here, but nothing I can say will make reading as cool as these guys did in fifteen minutes flat. I was blown away again this year by the kindness, patience, and positivity from this exemplary group of young men. They had a 6 AM practice that morning and many had to leave directly for class – but they still made time for us. From the moment they stepped in the door, they were swamped by tiny hands and big questions, and they handled it all, no problem. From bicep curls to autographs, they were great sports and brought so much joy to our building yesterday. This was the adorable aftermath of a “Can I touch your muscles?” conversation. Thank you so much to these hard working guys for taking time out of their busy schedules to come and spend the afternoon with us. A big shout out to Kyle King, organizer extraordinaire, who put up with untold emails and worked so hard to arrange such a wonderful day for our students. I’m noticing an awesome pattern here! 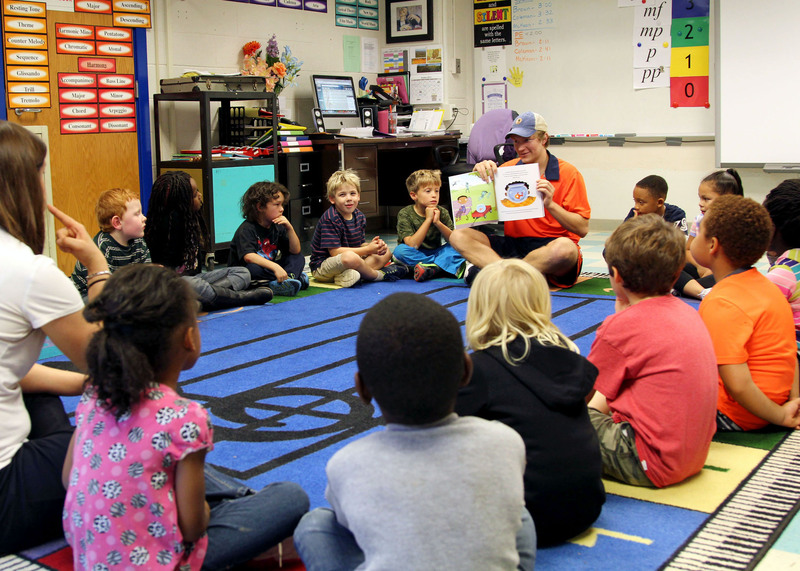 See last year’s Read for the Record celebration with the University of Virginia here. 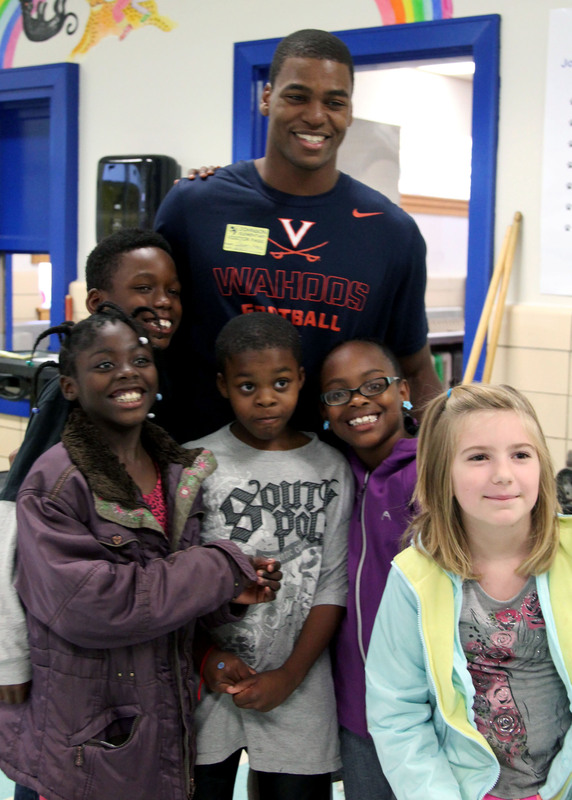 Johnson is so lucky to have such an amazing partnership with UVA. Want to see more of the awesome stuff that we do together? Check out the University of Virginia category on the blog here. 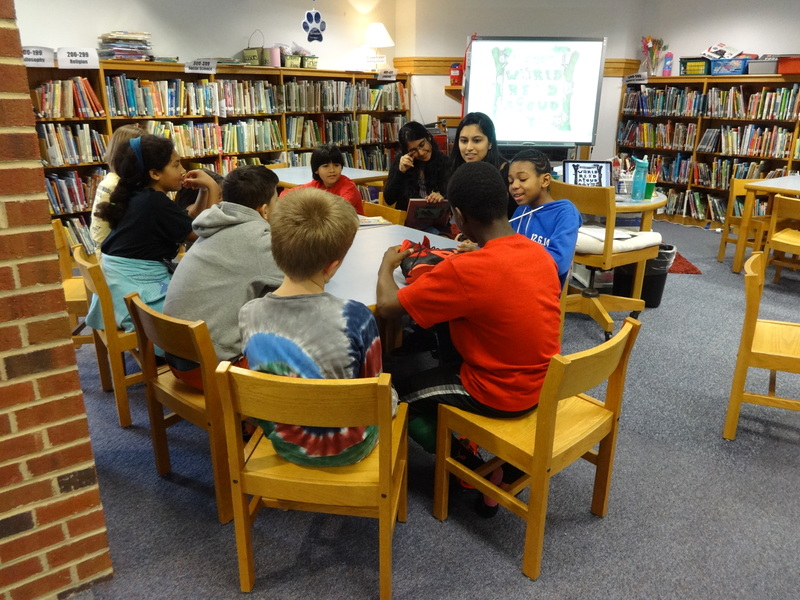 When 4th grade students entered the library on Wednesday afternoon, they were greeted with the following video, to teach them about World Read Aloud Day and why we were celebrating it together. This video was a great tool to spark a discussion about international literacy. 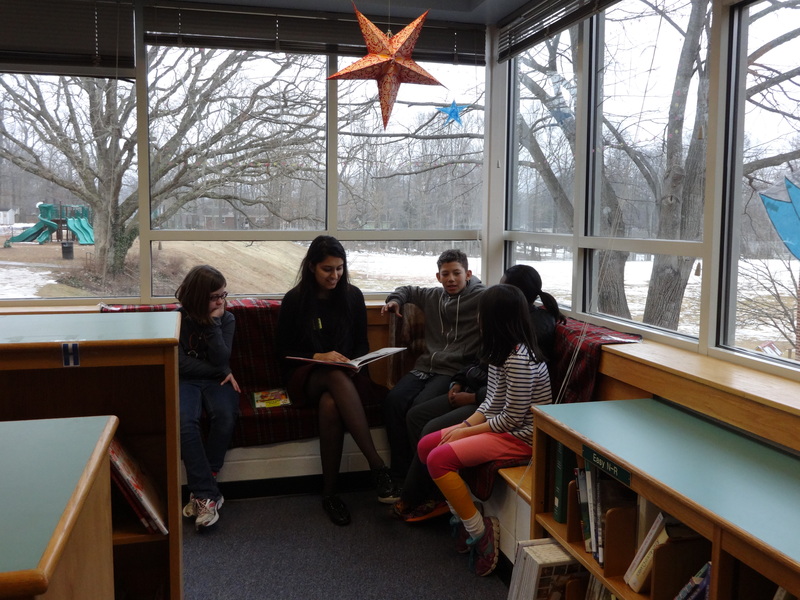 I asked students – did you know that not all children around the world have the opportunity to read and write? How do you think they share their thoughts and stories, or learn about new peoples, places, and things? How would you feel if you had no books to read, or could sit and stare at pages but had no way to decode the information inside of them? 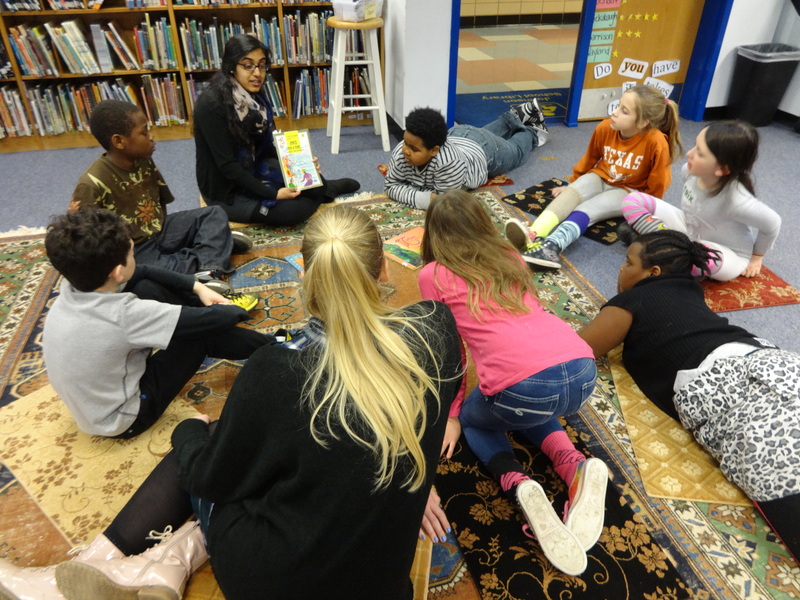 To help us celebrate World Read Aloud Day, Asha for Education traveled to Johnson to spend time with our students. Learn more about Asha by viewing their Facebook page here. 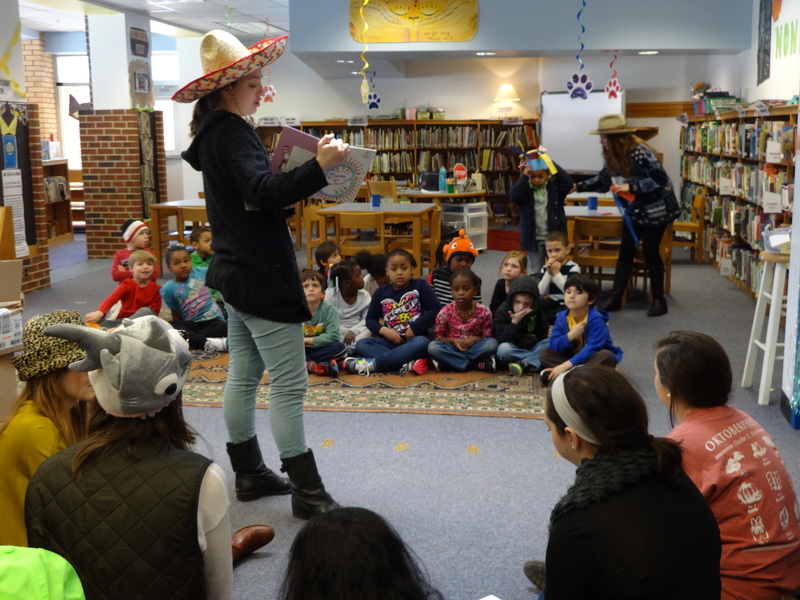 The ladies from Asha shared fairy tales and famous stories from other cultures with Johnson students, asking students to compare and contrast the exotic versions of famous tales with their domestic counterparts. 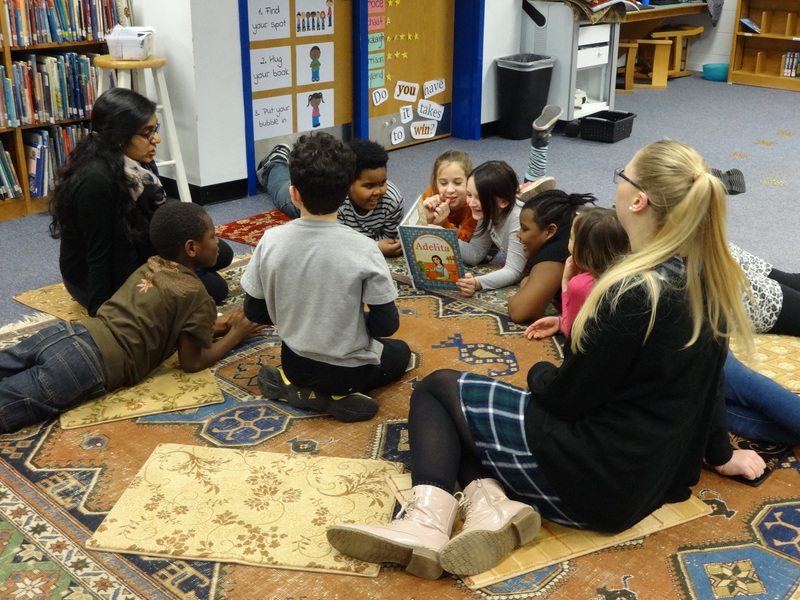 For example, I got to listen to one of Mrs. Rickabaugh’s student groups list the differences between an Arabic version of Cinderella and the American Cinderella – so interesting! It was awesome watching Johnson 4th graders interact with our Asha volunteers. Each group shared meaningful conversations related to literature and culture. 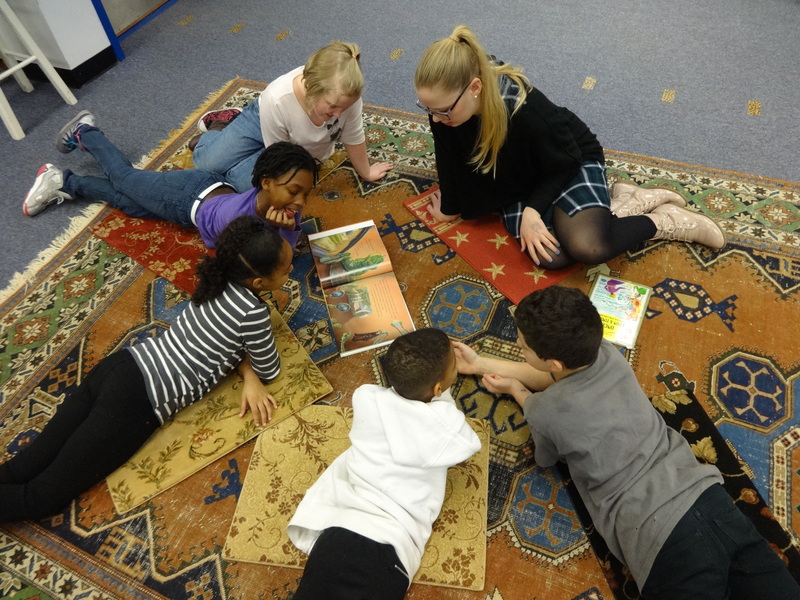 Many students also got a turn to read pages of the multi-cultural tales aloud, learning bits and pieces of foreign languages and pronunciations as they read. 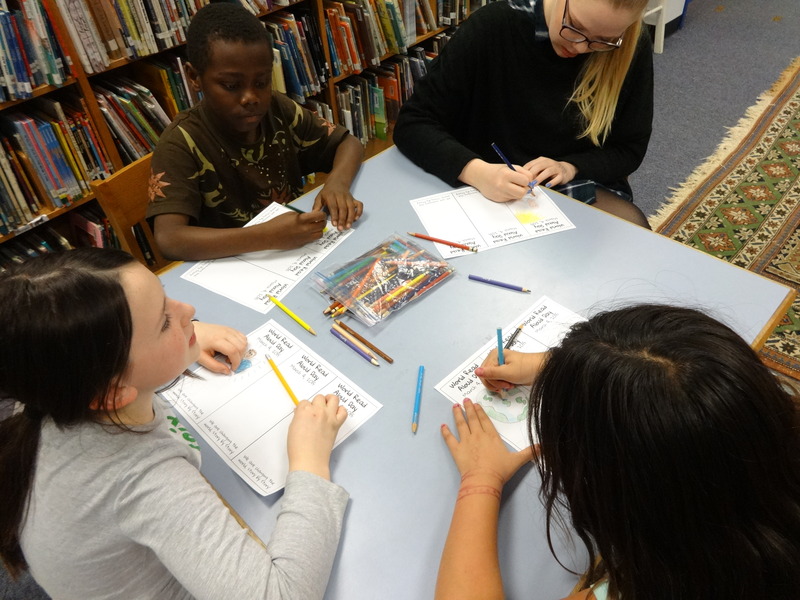 To close our time together, students were asked to create their own personal logo for World Read Aloud Day. Many choose to include globes and books – a perfect fit for the day! 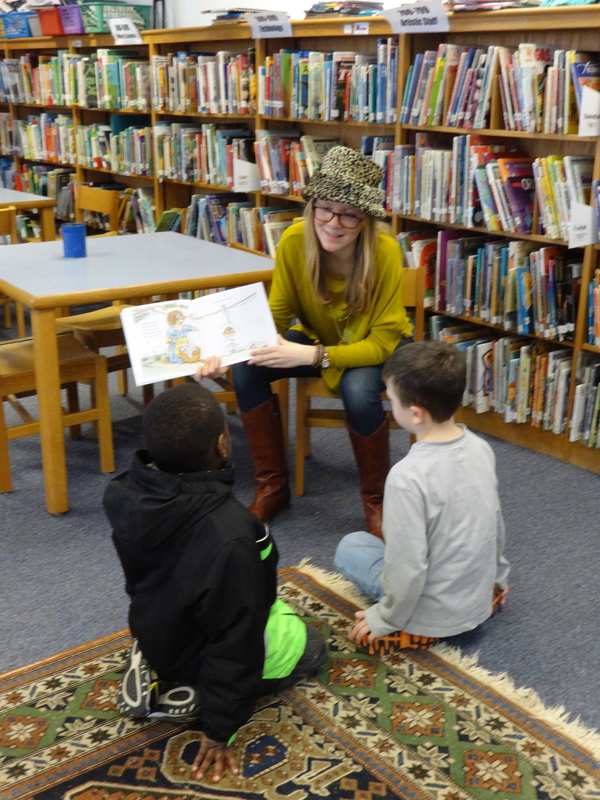 Each student was given three book marks and a mission – use your logo to teach three new people about World Read Aloud Day. Spread the word about literacy and share the belief that every child across the world has the right to learn to read and write! Thank you so much to our Asha volunteers for spending the afternoon with us, sharing stories, and bringing some fun new culture into our classrooms! We look forward to working with you again! Coming to you live from the second day of Read Across America Week! Monday, staff and students came to school decked out in their favorite hats in honor of The Cat in the Hat (Don’t believe me? Check out the selection of headwear in the photos below! ), and today we are celebrating Green Eggs and Ham by sporting green from head to toe. Don’t forget to wear your silliest socks and shoes tomorrow for The Foot Book day! At Johnson, we love visitors. 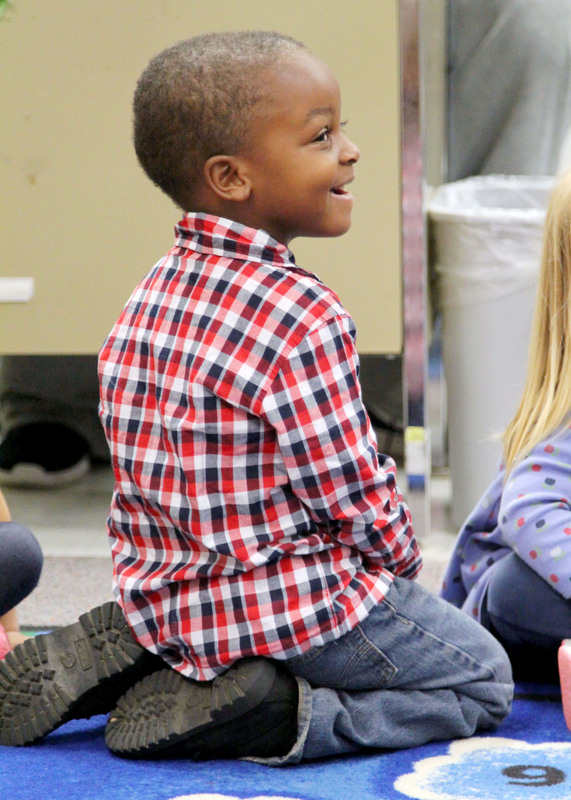 Young and old, teaching reading or chess, playing or working… we love having new friends join the Johnson community. So we were extra excited to spend our first day of Read Across America week with some of our favorite visitors – the ladies from the University Virginia chapter of Pi Beta Phi. You might remember this wonderful service sorority from last year, when they came to share stories with our third graders and give away books on a beautiful spring afternoon. I am so happy that Pi Beta Phi reached out to us again this year to spend Read Across America together. And, as you’ll see from the pictures below, our students weren’t too! Pi Beta Phi spent the afternoon sharing Dr. Seuss stories with Johnson’s kindergarten and first grade students, helping us to celebrate his birthday. 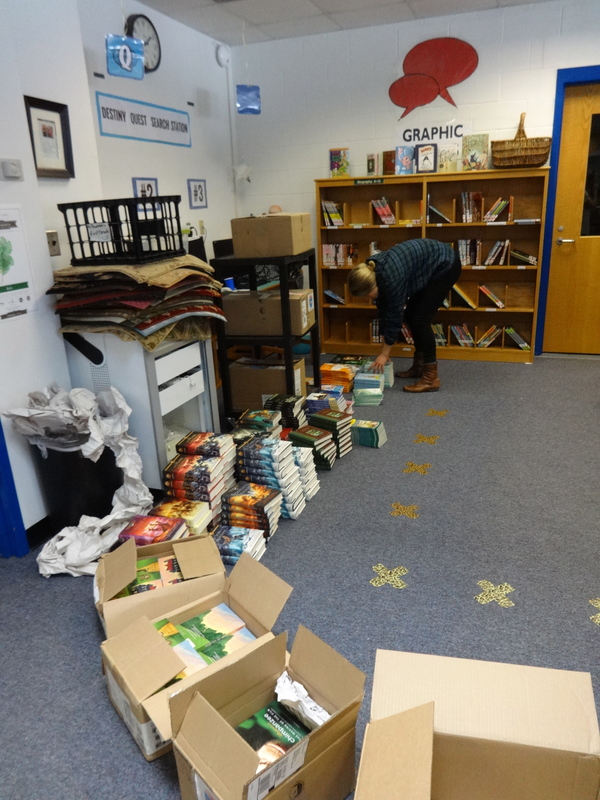 As if that wasn’t enough, they also awarded us with a grant for 500 FREE BOOKS – enough to send one home with each student, add to our library collection, and build classroom libraries all over the school! Your eyes are not deceiving you, there are TWO zeroes after that five. FIVE HUNDRED FREE BOOKS! 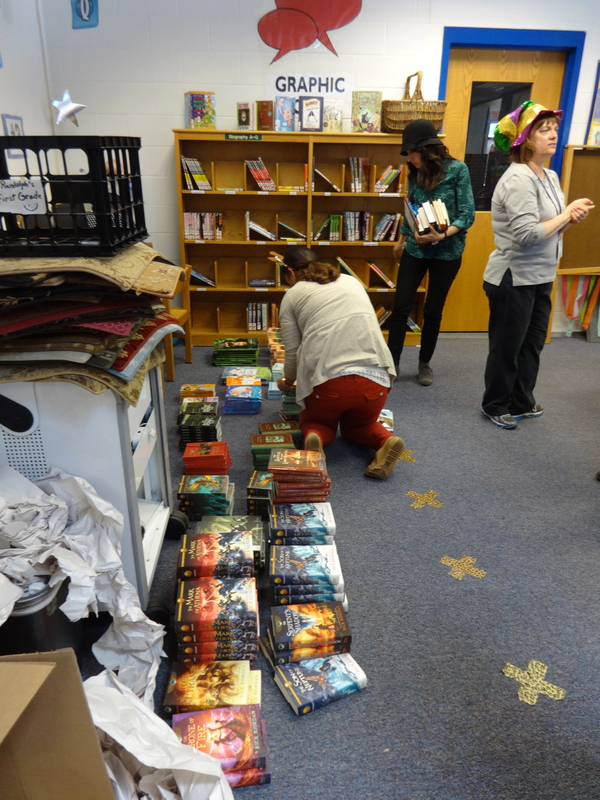 It took more than five members of the Johnson family AND five volunteers to lift, unpack, and organize all of those books. 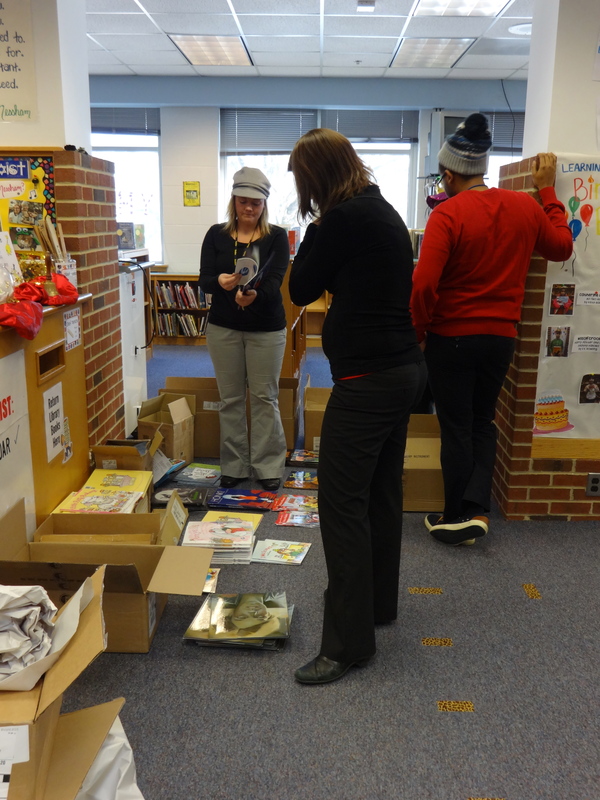 Once they were unpacked, teachers were invited into the library to “shop” for their students. 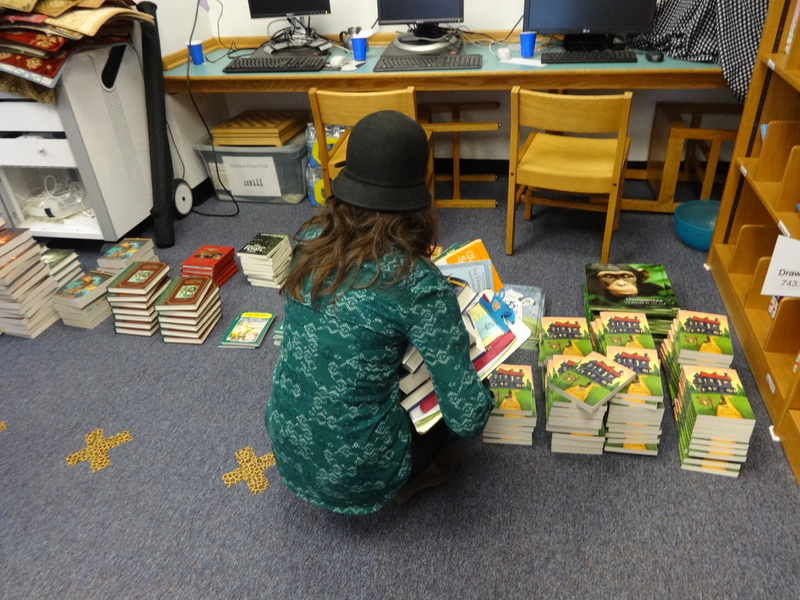 Teachers were thrilled to be choosing from such a wonderful selection, and took time and consideration to find a book for each student that would be truly enjoyed. Each student will receive one free book to take home and keep, thanks to the generosity of our friends at Pi Beta Phi. Thank you so much to the wonderful, caring, and patient members of Pi Beta Phi’s University of Virginia chapter for being such excellent members of the Johnson family. 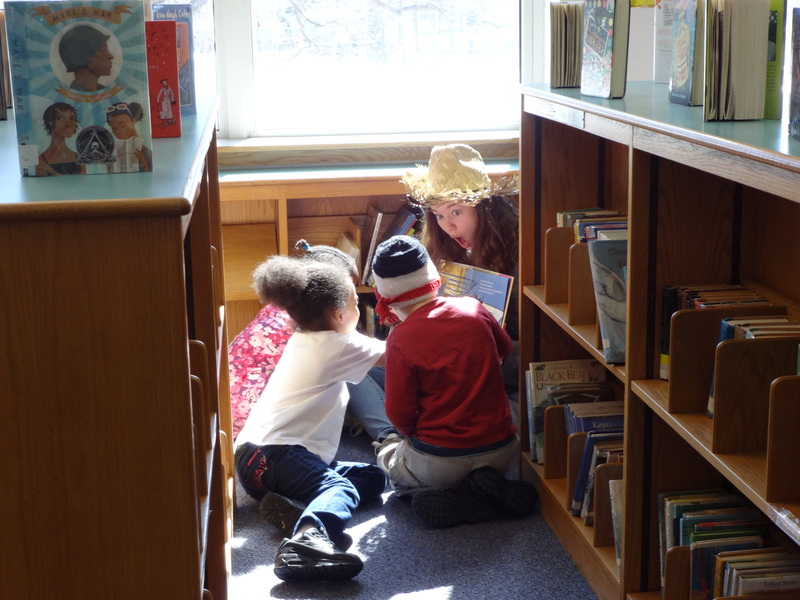 We love our new books, but most importantly, our students truly love sharing literature and quality time with you. Thank you for giving your time to us, and we hope to work with you again soon! See you tomorrow, Johnson family! Don’t forget, Wednesday we will be celebrating The Foot Book – so wear your wackiest socks and shoes to school! 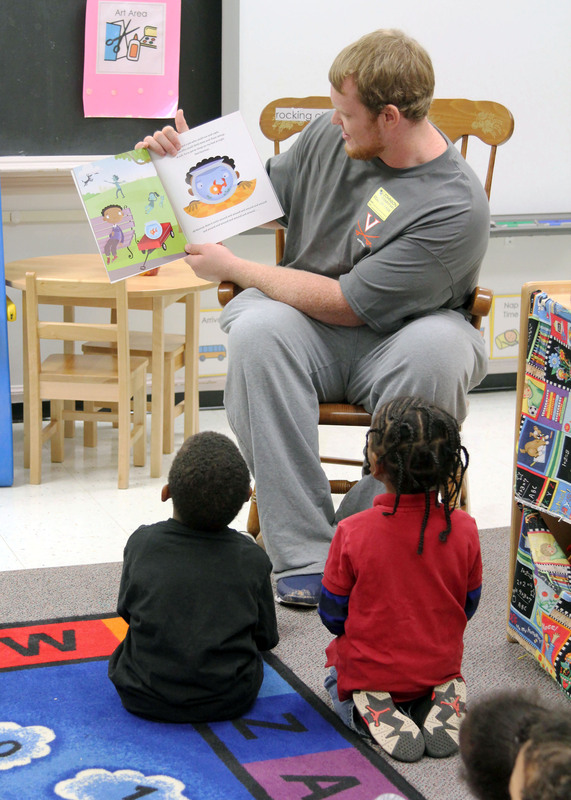 Every year, Read for the Record connects millions of teachers and students across the country in support of one common goal: early childhood literacy. 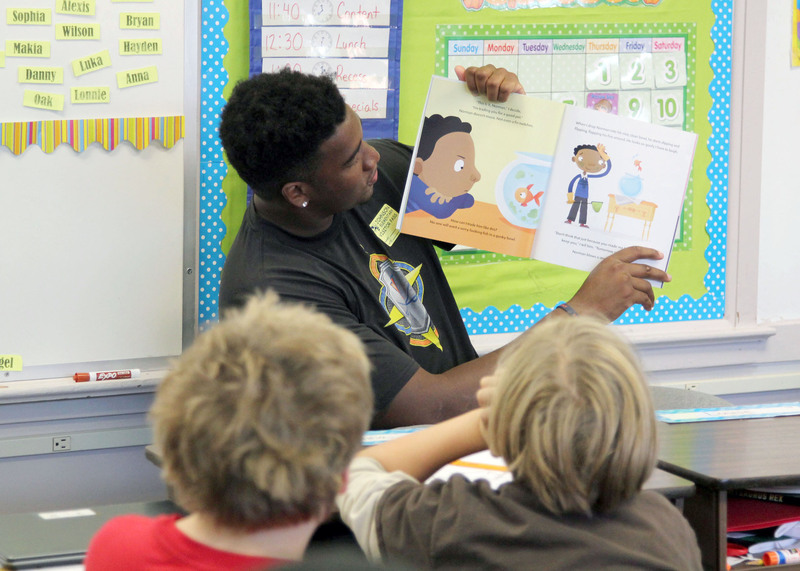 Jumpstart’s Read for the Record event challenges students of all ages to discuss the critical importance of literacy in their lives. At Johnson, this event is especially important as Jumpstart’s main goal is so important to us – the company’s #1 concern for elementary school students is kindergarten readiness, or helping students to enter school for kindergarten prepped with the tools that will help them to become enthusiastic, successful learners. 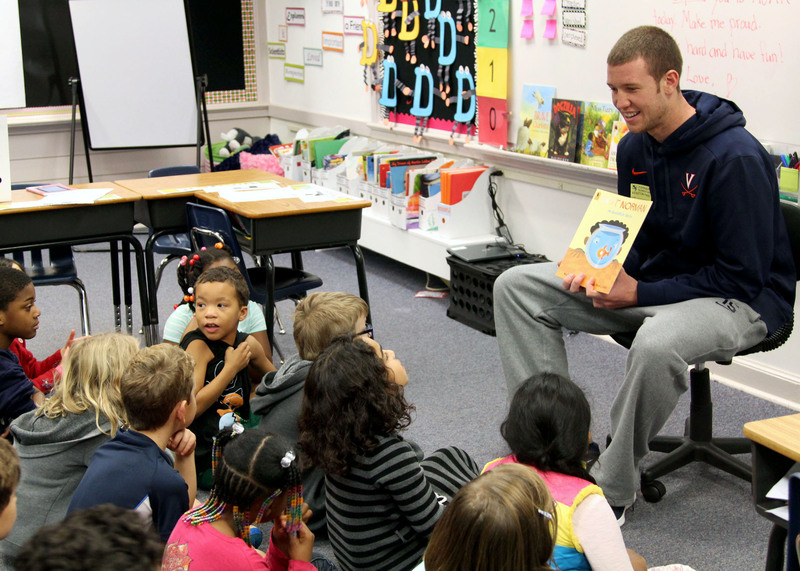 This year, Johnson was lucky enough to collaborate with the University of Virginia Athletics Department to bring some special guests to school to read with our students. 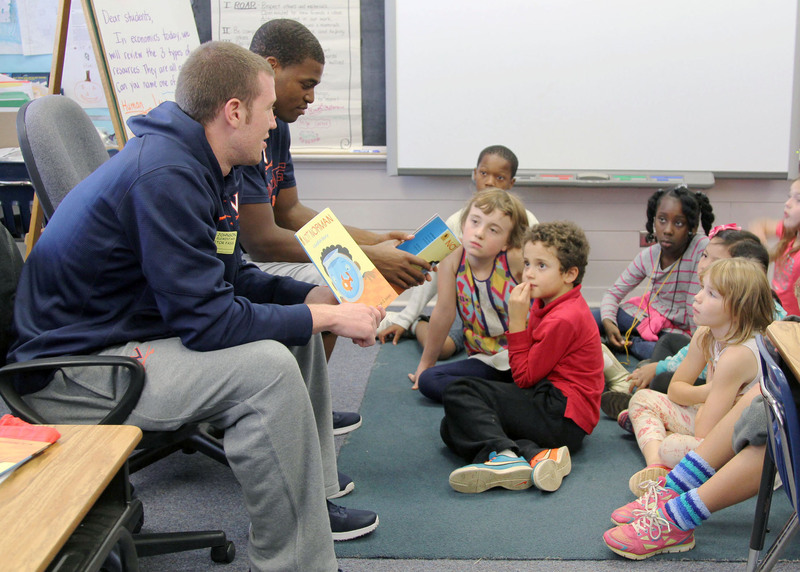 On Monday, eight members of the all-star University of Virginia football team joined us to read, discuss, and even play for the love of reading. I’ll skip the summaries and let the pictures do the talking here – I have no words that can tell you how much this meant to our students. Hopefully these photos will show you the joy and excitement that came to Johnson with these talented, kind, and genuine guys. 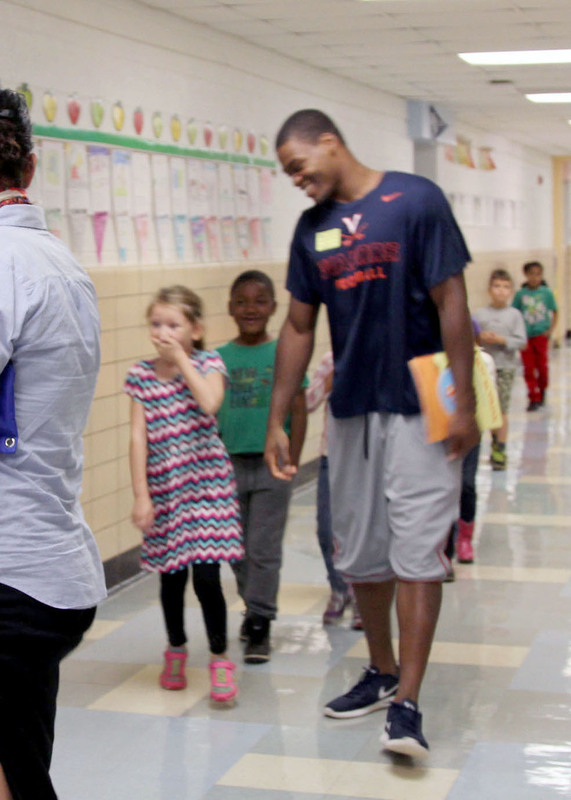 Saying that the kids were excited about these visit would be the understatement of the year! Although we all stress the importance of reading on a daily basis, hearing these words come from the mouths of students’ idols is an experience that they will never forget. We were all very happy to add some new, very kind (and very TALL) friends to the Johnson family. 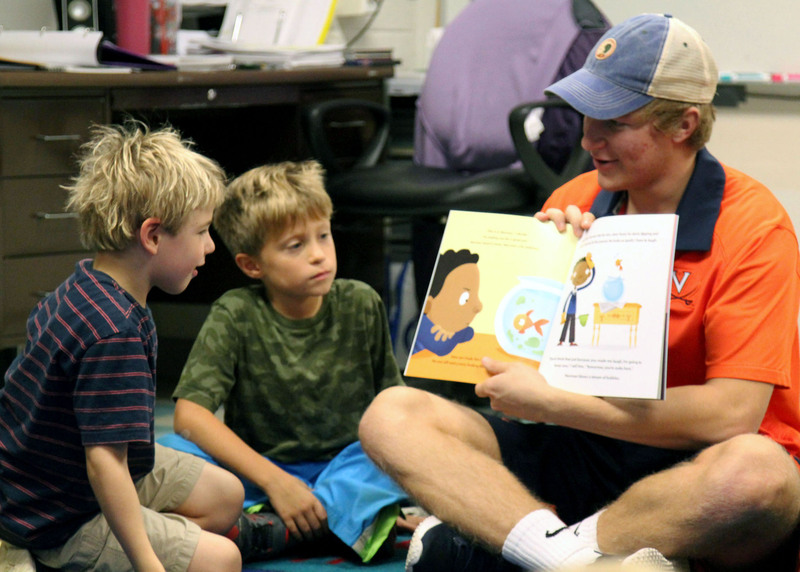 Thank you so much to our friends at the University of Virginia who worked so hard to make our Read for the Record event a success. Especially to the lovely young men who spent the day learning, laughing, playing, and teaching with students who will remember this day for years to come. 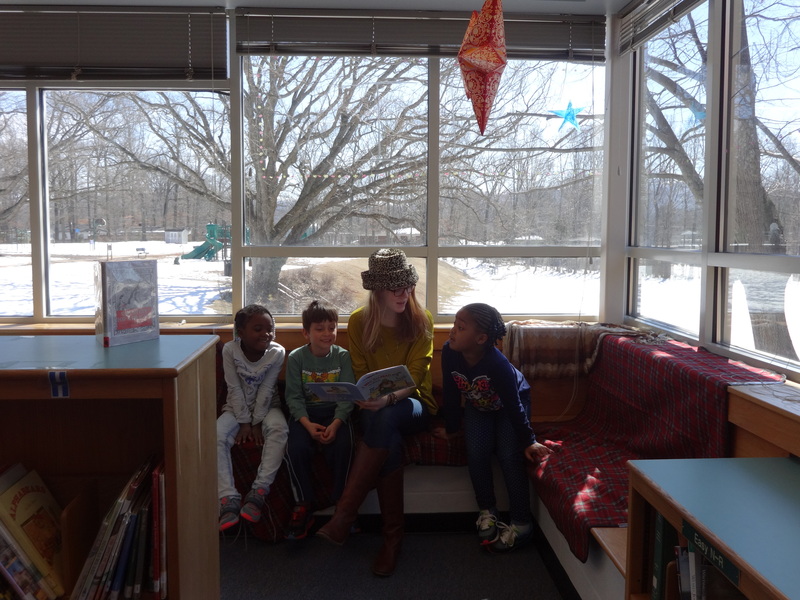 Read for the Record was featured on the NBC29 evening news! Watch the video here.